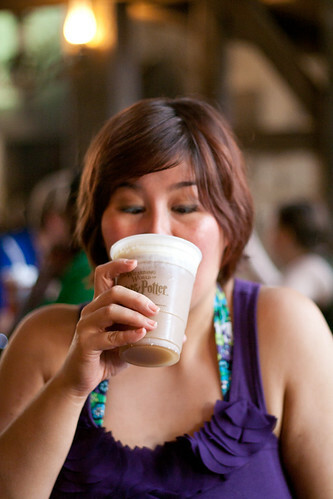 Ahh, butterbeer. You glorious, glorious little imaginary drink. 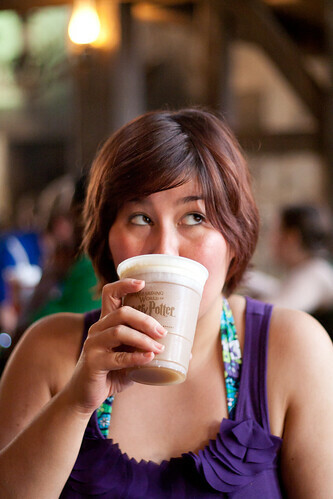 I had my first taste of you on this past February’s trip to Hogsmeade, straight from the taps at the Three Broomsticks, and since then I haven’t been able to get you off my mind. 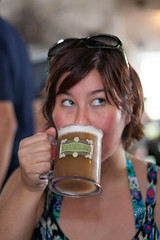 Good thing I have my upcoming Harry Potter-themed birthday party as an excuse to reintroduce you into my life, eh? 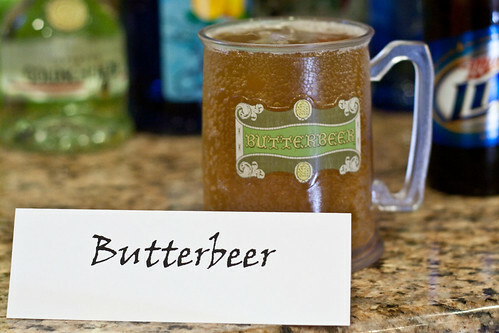 Of course, the Butterbeers that I had at the Wizarding World of Harry Potter were frozen (which would be hard to replicate at the party) and amazing but distinctly non-alcoholic. And this ain’t a party for house elves, you know. I fully expect my guests to get their buzz on. So naturally, in order to get an alcoholic, non-frozen version right, some experimentation was in order. 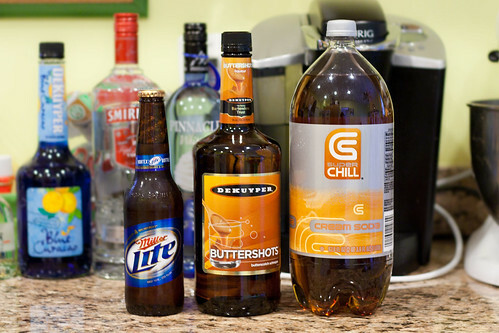 Most of the recipes that I found online called for cream soda and butterscotch schnapps, that’s it. And while I’m sure that combination works for some people, the unadulterated amount of sweetness from that concoction was ridiculous. Pretty much undrinkable. Luckily, my lovely friend Lara already had a solution. 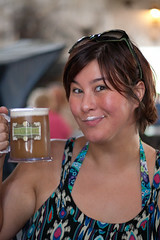 She recommended combining the cream soda with light beer as well. 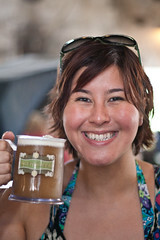 That way, she said, you get twice the fizzy carbonation, half the sweetness, and the sugar masks the beer-y flavor. So I took her advice and tried it out: a shot of schnapps, half beer, half soda. Turns out, she was totally on point! The beer flavor is just barely there (it would probably be more noticeable if you used a non-light/stronger tasting beer), and the butterscotch and vanilla flavors still come through! Even by halving the cream soda, however, I did still find the concoction crazy sweet. The schnapps itself is really sweet and sugary too, after all! So my next experiment was with a ratio of almost 2/3 beer to 1/3 cream soda, and I thought it was great. If you absolutely can’t stand the very thought of tasting any beeriness, you might want to stray towards the first combination, but I found it very refreshing and still totally Butterbeer-y. I added some coconut whipped cream to replicate the head, purely for photo effect since it added even more (read: too much) sweetness. Pour one shot of schnapps into a glass (or, probably more accurately, a solo cup). 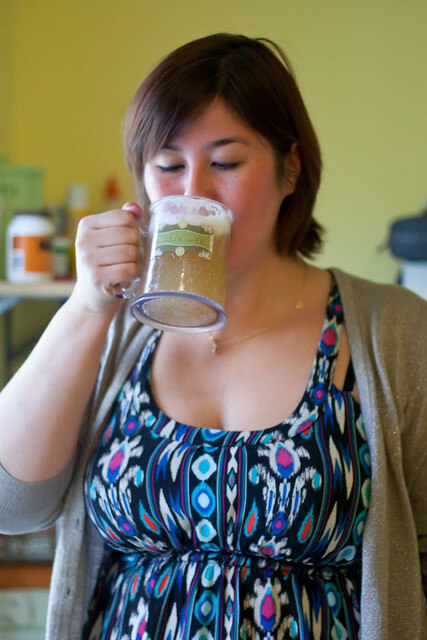 Fill it one-third of the way with cream soda, then top off the last two-thirds of the cup with beer. Enjoy, Muggles and wizards alike! Cupcakes and Pizza and Panda, Oh My! Oh. My. Lanta. Good thing I have a birthday party to attend this weekend and a reason to drink this deliciousness. So glad I could be of assistance 🙂 I CAN’T WAIT!!!! 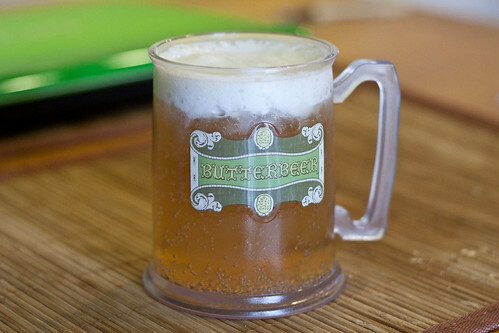 I need a mug of that sitting on my desk while I work. For real! I wouldn’t have thought to put actual beer in it. That’s interesting! Yours looks a little less rich though. Oooh, I just had an idea! Hard Cider, like Strongbow, instead of beer. Thoughts? Oooh, I would definitely try that! 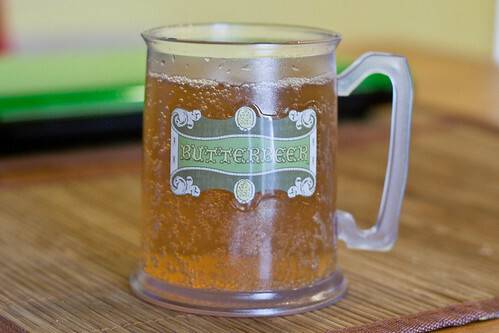 Not sure if the apple-y flavor would enhance or detract from the butterscotchiness, but I can’t imagine it would taste bad! I never even considered diluting with cream soda. I think that you’re right, it would probably work, though it might be generally less flavorful. Mmmm. Awesome stuff!!! You’re going to have so much fun at your party! That.Sounds.AMAZING. Happy birthday week-hope you enjoy it! AHHHH I LOVE THIS!!!! 🙂 Since I can’t make your party, I can come by and drink it with you some other time, right? I think this sounds great! Also, I’m sorry I couldn’t make it to your party Gretchen but thank you for generously thinking of me. Hopefully we can get together soon!